A blended balance of paint perfect ingredients and shine-restoring capabilities. From the same line that brought our #1 carnauba paste wax, comes the newest in the Pinnacle Souveran line-up – Pinnacle Souveran Jeweling Wax. 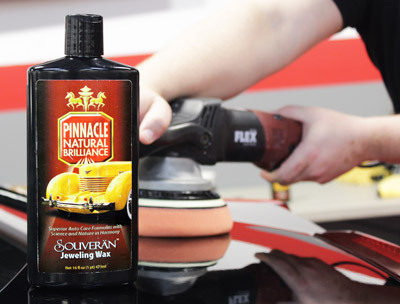 Designed as a light cutting, one-step cleaner wax, Pinnacle Souveran Jeweling Wax uses advanced abrasive technology to correct light swirls and scratches from painted surfaces and shine them to perfection. Pinnacle Souveran Jeweling Wax creates an intensely deep, wet shine and will protect your paint after just one use. With Pinnacle Souveran Paste Wax as the centering force in the Pinnacle Natural Brilliance Car Care line, whenever a new product is introduced, they must be the best of the best. No shoddy chemicals, runny dressings, or streaking detailers have a place in the Natural Brilliance line. So when Pinnacle Souveran Jeweling Wax was in it’s infancy stages of production, the creators knew nothing could be skimped or missed. Pinnacle Souveran Jeweling Wax is an all-in-one product that will not only perfect and protect your paint but will also provide a shining, jewel like finish. Pinnacle Souveran Jeweling Wax is one of the most technologically advanced products in the line today. 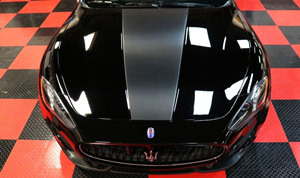 Incorporating advanced abrasive technology that will actually remove light swirls and scratches (rather than just covering them up) without leaving micro-marring behind, into a long-lasting paint protection formula was no easy feat, but Pinnacle has achieved just that! Pinnacle Souveran Jeweling Wax is an all-in-one product that will not only perfect and protect your paint but will also provide a shining, jewel like finish. Whether it is being used on a brand new car fresh off of the car lot, or a daily driver that needs a bit of attention, Pinnacle Souveran Jeweling Wax preforms like a true all-in-one should. You no longer have to spend hours of multi-step correction work to achieve a show-car finish – with just one application of Pinnacle Souveran Jeweling wax, your car’s paint will be clear and shining like never before. 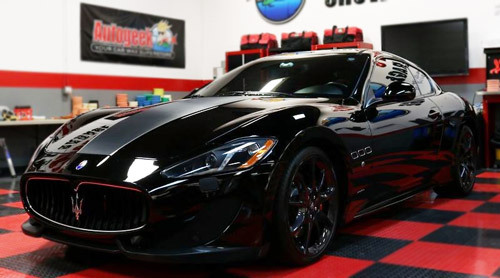 Mike Phillips used the Pinnacle Souveran Jeweling Wax on this 2014 Maserti GT Sport to fully correct the paint of swirls and light scratches, while also leaving behind a layer of protection that shines like none other. With a standard protection time of approximately 3 months (which can be extended with maintenance products like Pinnacle Crystal Mist or Pinnacle Liquid Souveran Spray Wax), Pinnacle Jeweling Wax provides protection longer than even some standard paint sealants on the market today. And while a paint coating, or even a quality paint sealant or carnauba wax, may provide longer protection, we can assure you that you’ll be doing more than one step to achieve that protection. For a brilliant, jewel-like show car finish, Pinnacle Souveran Jeweling Wax is the only one-step product you’ll need! Directions for use: Before application, ensure the vehicle has been washed of any large debris and dried. Shake well and apply out of direct sunlight. Pinnacle Souveran Jeweling Wax can be applied by hand or machine. Using a foam polishing pad, apply to paint in an overlapping circular motion to one panel at a time. 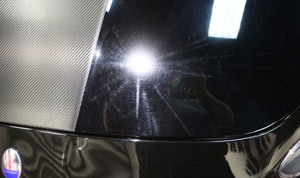 Use a soft microfiber buffing towel to remove excess product and buff to a high shine. Pinnacle Souveran Jeweling Wax produces best results with a polishing or all-in-one foam pad. Apply several dime-sized drops of product onto your polishing pad. With the machine turned off, spread the product over a 2×2 sq. ft. area. Using moderate pressure, work the product over the area in overlapping passes. Slower passes increase ability to remove imperfections. Repeat if necessary. Buff off excess product with a soft microfiber buffing towel.